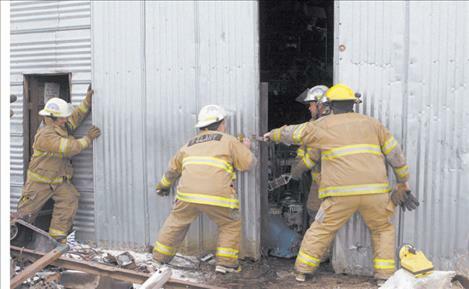 Ronan firefighters attempt to close sliding doors of the shop that caught on fire Monday afternoon. There were no injuries and minimal damage to the maintenance/junkyard shop belonging to Leroy Lake. RONAN — There were no injuries on Monday when a shop caught on fire northeast of Ronan on Old Highway 93. The former junkyard and maintenance shop caught fire due to undetermined causes, but fire officials suspect it was related to the shop's wood stove. Leroy Lake, owner of the property called 911 shortly after the wood stove caught fire a little after 3 p.m. The emergency dispatcher then dispatched the Ronan Fire Volunteer Department. According to Ronan Fire Chief Mark Clary, fire crews arrived within five minutes of the call. Clary said the damage to the structure was minimal, and the firefighters extinguished the fire within minutes. The crew ventilated the tin and wood structure by sliding open door panels from the side of the building and placing fans at the doorway in the opening. When the smoke had cleared from the inside of the building, the area was visible enough for the firefighters to enter the structure and fight the fire, Clary said. The fire was contained to the corner of the building near the wood stove. Ronan Volunteer Fire Department responded with one engine, one water tender and a heavy rescue vehicle.